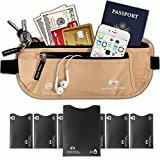 ✓ A MUST FOR THE MODERN DAY: A Premium Quality Money Belt designed to be ultra-lightweight, and comfortable, with RFID safeguard protection in a slim sleek design, virtually invisible to thieves. One-size fits all, the belt is fully adjustable. New 2017 Deluxe Design. ✓ ULTIMATE PROTECTION: Multi-layered lining with the latest RFID Blocking technology material protects you from identify theft, unwanted scans and hi-tech pickpockets. Ensuring your passport, ID and credit card information always remains safe, secure and confidential. Now with Double the Protection with bonus RFID Blocking Sleeves for your additional wallet or purse. ✓ SUPERIOR QUALITY: Highly durable travel waist pouch, made using only premium-grade materials. Water resistant & flexible 210D ripstop nylon, high quality YKK zippers, extra reinforced stitching, with FeelSoft skin friendly moisture absorbing rear mesh to prevent uncomfortable heat & moisture. Strong Xtreme elasticated adjustable strap fits sizes 26″ to 56″ comfortably. ✓ OPTIMIZED CAPACITY: Two front zippered pockets & large concealed rear pocket. Inner pockets allow convenient organization of passports, tickets, credit cards & cash. Includes a quick-release carabiner clip to secure keys & usb sticks. Fits iPhone6s, iPhone7, GalaxyS7 & more. Contents & iPhone excluded. ✓ BONUS GIFT included – RFID Blocking Sleeves for your additional wallet or purse (6 Credit Card & 1 Passport). Buy NOW with CONFIDENCE – 365 DAY MONEY BACK GUARANTEE with every purchase. Always ships directly from UK. Includes BONUS Gift RFID Blocking Sleeves for your additional wallet or purse for ADDED Protection! We are a team of master travelers & outdoor fanatics with the sole purpose to deliver to you the best travel accessories on the market. Our products have been designed & engineered using only premium quality materials & are built to last. We use years of extensive experience & knowledge to deliver high quality products. All our products are rigorously tested in the field & optimized in design to provide the ultimate quality travel solution for you. ✔ Premium Quality: Only high grade materials used – water-resistant rip-stop nylon, double stitched reinforced seams, YKK zippers & anti-wear pullers. ✔ Optimal Capacity: 2 front zippered pockets & hidden rear pocket. Internal pockets & carabiner clip holds all precious travel documents & items together. ✔ Secure Protection: Multi-layered lining with latest RFID blocking technology safely protects you from identity thieves & high tech pickpockets. ✔ Comfortable: Can be worn in multi-positions; over clothes, on the hip or comfortably under clothing against the skin with the skin-friendly FeelSoft breathable rear mesh. ✔ BEST VALUE: Includes BONUS GIFT 6 credit card & 1 passport RFID Blocking Sleeves. Fully adjustable strap fits all sizes. ✔ Ideal Present: Give family & friends the gift of worry free travel. Perfect for husbands, wives, dads, moms, students, golfers & outdoor enthusiasts. Enjoy piece of mind with our no questions asked 365 days 100% satisfaction guarantee! Upgrade your travel security in style now to also get the added Bonus Gift, click ADD-TO-CART to order, RISK-FREE!